Can Grapefruit Really Make You Slim? Remember the Grapefruit Diet from way back that had us eating the citrus fruit at breakfast, lunch, and dinner? 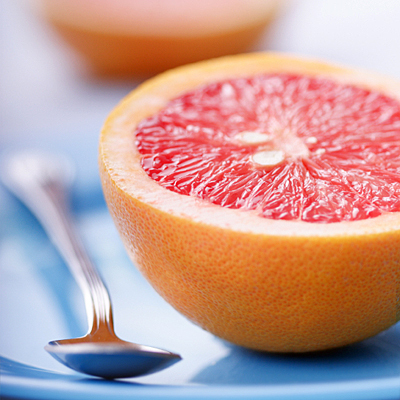 New research shows grapefruit is actually a powerful diet food. Women who consume any amount of grapefruit or grapefruit juice weigh nearly 10 pounds less and have a 6% lower body mass index than their non-grapefruit-eating counterparts. Remember the Grapefruit Diet from way back that had us eating the citrus fruit at breakfast, lunch, and dinner? That plan may have been just a kooky fad, but new research shows grapefruit is actually a powerful diet food. A review of data from 2003 to 2008 reveals that, on average, women who consumed any amount of grapefruit or grapefruit juice weighed nearly 10 pounds less and had a 6 percent lower body mass index (BMI) than their non-grapefruit-eating counterparts. The fruit is also a source of vitamin C, potassium, and magnesium, but Rampersaud says there's no evidence revealing any magical fat-burning ingredient at work, as proponents of the old Grapefruit Diet have claimed. To reap the benefits, Rampersaud suggests making the tart and tangy fruit or juice part of your daily diet. Not a grapefruit lover? Based on this and other studies, starting meals with water-rich foods, such as cucumber or watermelon, could have a similar effect, says Christine Gerbstadt, MD, RD, spokesperson for the Academy of Nutrition and Dietetics.